The very first of our emerging garlic scapes. We had really hoped the new salad greens growing in our back field would be ready for this week's harvest. Some of it is, but not enough if we want to have a continual, week to week, supply. We took one last careful cutting from the salad growing in our greenhouses before pulling it all up to make room for planting beans, carrots and beets. I'm amazed that just these two early plantings of greens have provided us with 6 weeks of salad mix! Sam, Shain, and Steve turning old salad beds into newly composted rows for planting beans. The pac choi and Chinese cabbages in this week's share are from our second planting in greenhouse 3. These are cold weather crops so they are starting to bolt from the heat (yes, occasionally, it has been hot here on the farm). We'll need to get the rest of them out to you as soon as possible, even if the plants are still a little small. Garlic scpaes are likely a new item for those who are new to our CSA. They are just starting to emerge from our garlic crop. The few you are getting this week are very small, only 3 to 4 inches. Next week they will be bigger starting to curl. The week after that they will be plentiful and very curly. After that, they could be gone. Scapes come on fast and then that's it. The "scape" is the center stalk of a hard neck garlic plant that starts out tender and deliciously edible. In a few short weeks, the flexible curly-Q becomes a hard, straight stalk and eventually the small flower pod on the end blooms to spread it's seeds. We snap off the scapes because they are an early season, garlic-y treat and to divert the plant's energy towards growing a big, beautiful bulb underground. We've collected many recipes and ideas for using garlic scapes here. Some of the most popular are: in salad dressing, pesto, hummus, pickled, roasted, and chopped up fine on salads or in soups. Last night, Shain chopped some up and added them to his quick veggie stir fry. These have become a trendy, fun attraction at farmers markets so there are an abundance of recipes and pictures on the internet. If you have a favorite idea or recipe, please share! We've had two nephews with us on the farm for the past 10 days. Farmer Shain taught them the value of good, hard work. They spent several days weeding old compost piles and pulling up old beds of mizuna, arugula and salad. On most days, they were covered head to toe in dirt and/or mud. Then we played! We even converted one of the boys to thinking our plant based diet isn't too bad. He said our EverGreen Farm salad mix is the best he's ever tasted. Playing around with some new recipes yet? I heard from several folks who made the radish salsa. I was brought this lovely jar of goodness this week. Thanks Katie! Fermented, sliced radishes. By workshare Katie. Beautiful bouquets of radishes and Japanese turnips. All these foods you've received before and will likely continue receiving until some of our other crops are ready to harvest. I was weeding the kale today and it will be ready soon. Swiss chard isn't too far behind. The calendar tells me the garlic scapes should be on soon, but they weren't when I just checked yesterday. Radish ideas: Talk among the workshares this week was making radish salsa, fermenting them, and also making pickled radishes. Radishes are a common ingredient in salads, sliced very thin. One of my new favorite places to look for recipes is on Pinterst - with it's many interesting food ideas and beautiful pictures. We love recipe ideas and recommendations! This looks like a good one. From CSA member Stacy "Looking forward to more radishes after I discovered this recipe! It is seriously addictive and you can throw the radishes, turnips and pac choi in the mix. Thought you may want to give it a try." Soba Noodle Salad with Caramelized Chicken and Chili Oil. Our family snuck away from the farm a few days last weekend. It was wonderful to spend some time with family. We camped in Lava Hot Springs, Idaho. My favorite activity was soaking in the hot pools. We are so grateful to those who helped us get a week's worth of work done in just a few days and to our neighbors who take care of the farm when we leave. We came back well rested and happy to continue in our efforts. Several folks have expressed their concern on our behalf for the near freezing temperatures these past several days. We have been closing greenhouses early and covering all sensitive crops with our thickest row covers. So far, so good. We've actually lost more plants to bugs than to temperatures. 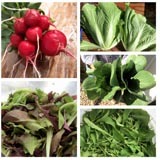 New items in your share this week: Japanese turnips and romaine head lettuce. *Remember to remove the tops of the radishes and Japanese turnips to keep them fresh and crisp. The turnip greens are also very nutritious. We like them in soup (with potatoes, cream & bacon, for those who are so inclined. 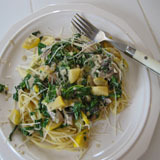 We are tweaking our old recipe with healthier options). I've also dehydrated the turnip greens to use in the winter and I was amazed at how fresh they were in the soup. One workshare freezes all her greens for smoothies in the winter. The radishes are ALL on at once! You'll be getting a large share for a few weeks. Kathy, a long time workshare, made a salsa recipe last week with radishes as the main ingredient. She said it was great! The recipe also called for juice of a lime, a pepper, cilantro, red onion, and cucumbers. We forgot to get the exact recipe, but I see several on line. We harvested all the remaining Chinese cabbage and pac choi from greenhouse 6 for this week's share. There is a second planting of both in greenhouse 3, so there will be more when it is ready. And just as soon as we emptied these rows, we filled them with basil and pepper plants! It's great to see the season progressing from early season to summer crops. As I mentioned last week, the arugula and mizuna have bolted and we are pulling up those plants (they get fed to the chickens) to make room for planting things like more beets and carrots. Most of our work this week has been focused on planting, or preparing places to plant, and harvesting foods for the CSA shares. We are getting a lot accomplished and it's so nice to keep up on our chores. We have some great workshares that come to help every week and for this we are very grateful. Workshare Katie, featured on the cover of a magazine! EverGreen Farm was featured in the Country Folks Grower magazine recently. Pretty cool! I'm looking forward to getting the hard copies in the mail. Here's a link to the article. BUGS! We are starting to see more bugs and the damage they cause to various crops. Above is a picture of a tomato plant with it's two companion basil "trap plants." Bugs like grasshoppers, ear wigs, and ants love tomatoes, but they love basil even more. These poor little basil plants have been munched down to stubble by emerging grasshoppers. It's time for Farmer Shain to get out his secret weapon (an organic treatment called Nolo Bait) and do some serious damage to the grasshoppers! Hope you all have a great week and ENJOY your veggies! Temperatures are on the rise and the effects are varied throughout the farm. Some cool weather crops have started to bolt. This is a picture of our first crop of mizuna (one of the greens in our spring salad mix). Just too warm for it now in greenhouse 7. We have another second planting of mizuna in greenhouse 2 which is doing the same thing, though planted weeks later than the first. Once again, goes to show how the plants react to temperatures and growing conditions more than our carefully desinged planting dates. The arugula is also starting to bolt, not to this stage yet, but I am doubtful it will be suitable for harvest next week. We know arugula is ultra sensitive (to bugs too), but it's worth the effort for the few weeks we get to enjoy it every year. Another result of warm weather is watching how quickly some of the crops have progressed. Sometimes I swear the plants grow inches over night, especially after a day of watering. We've watched the second planting of salad greens and radishes grow very rapidly to the point we are harvesting off of them at the same time as the first. There's nothing that can be done about this, except to enjoy the bounty when everything comes on at once. We are still in full planting mode. This week we put in more tomatoes, basil, broccoli, and cauliflower. We still have dozens of seed flats with baby plants waiting to be transplanted. Some seedlings will fill the rows we clear out as crops are harvested for this and next week's shares, others are ready just as soon as we get some weeds cleared. Shain is also preparing more field space for his succession plantings of salad and other crops. Lots to do this time of year. Weedy patch will soon be rows of broccoli and cauliflower.